The 40th Anniversary edition of the World Leasing Yearbook is the only guide which covers all the world’s leasing and asset financing markets in one single volume. Available in digital and hardback formats. Over 50 country reviews written by the top industry players in the markets cover all leasing sectors with core data for each country with analysis and projections. Covering 356 pages it is the essential guide to current opportunities in international leasing and asset finance and provides valuable reference data for all players in the field. The new 2019 edition includes the latest Global Leasing Report which includes unique data on market volume and growth by region, including a ranking and analysis of the top 50 leasing markets by size. Features data from 1997 to date. The complete Global Leasing report is ONLY available in the World Leasing Yearbook. The accompanying World Leasing Database, which gives direct access to 5,000 companies and over 6,000 contacts from all sectors of the industry, is supplied on disc making the data easily searchable and downloadable. 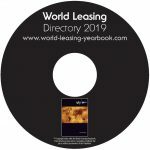 The Database is totally unique to the World Leasing Yearbook and is an invaluable networking tool for all market professionals. The Global Leasing Report features new and unique data on international leasing volume and growth by region. A ranking of the top 50 leasing markets, global leasing data from 1997 to date, market penetration levels, GDP penetration ratios and market volumes and shares for all 50 countries. Features over 240 tables and graphs containing essential statistical data in one volume. Over 50 individual country reviews cover all leasing sectors with core data and statistics for each country. Reviews of last year’s activity, analysis of the current situation, and projections of future trends and developments. A look at digital transformation in the asset finance markets. A review of how cloud hosting, artificial intelligence and SaaS will impact the asset finance and leasing markets in the coming years. Comprehensive analysis of the European leasing market is provided by Leaseurope, with core data including 10 tables and charts providing leasing volumes, penetration and growth rates by client and asset type. A study of leasing in Latin America is provided by the Alta Group from its AltaLAR 100 Report, providing in-depth information on leasing portfolio size and growth by country in the region and including a run down on the 100 largest leasing companies in Latin America. Product reviews from over 30 leasing and asset finance software providers. The unique and comprehensive World Leasing Database giving you direct access to over 5,000 companies in over 100 countries in the asset finance and leasing industry. Including: general leasing companies, specialist leasing companies, captives, investment bankers, consultants, brokers, lawyers and accountants. Grow your professional network by harnessing our unique database of names on disc giving you instant access to 6,000 asset finance and leasing global contacts. Internationally recognised as the standard reference source for the leasing and asset finance professional, the new 40th Anniversary edition of the World Leasing Yearbook is available to order. For more information or to order your copy of the World Leasing Yearbook 2019, contact Lisa Paul on +44 (0)1206 579591 or email: lisa@worldleasing.co.uk.